Calkins Park on the top end of Foster Reservoir is a decent place to do training dives or to explore for things that fall overboard from boats being put into the water at the boat ramp. We have done some training dives here for a rescue diver class. The dives were pretty miserable but it was excellent training for all of the students. 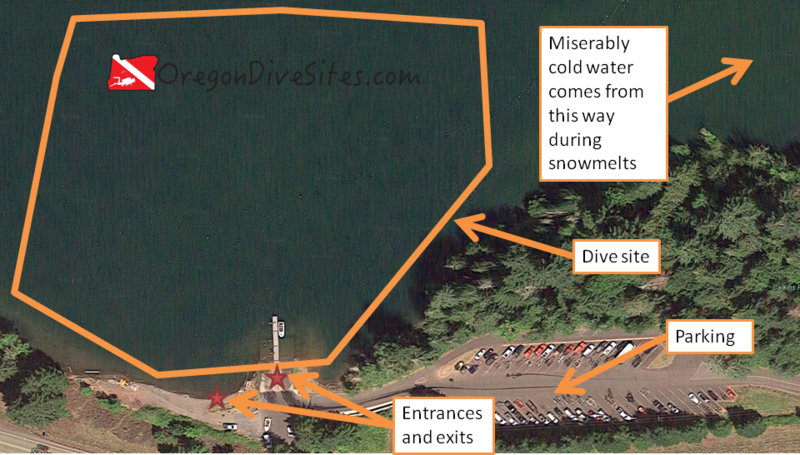 If you’re looking for a site to dive in the central Oregon Cascades, this could be just the ticket. Gary Halvorson, Oregon State Archives [Attribution], via Wikimedia Commons. Calkins Park can be beautiful in the summer and fall but can be a wet, miserable place in the winter and spring. You can probably already tell that this isn’t our favorite dive site. The bottom is muddy and will cause complete blackout conditions if you touch it. In the winter and spring when snowmelt is pumping down into the reservoir, the water can be right at freezing. In the summer and fall, boaters crowd the boat ramp and make this site not very safe for SCUBA divers. That being said, Calkins Park is a great place to go train in sometimes challenging conditions. We have participated in and seen several rescue diver classes take place here. The conditions are demanding and the site is challenging enough to be useful for training but not so challenging as to be bad for teaching a class. If you go to dive here for fun, more power to you. You might find a lost wallet or fishing gear that fell off of a boat getting put into the water. On one particular day, we did several training dives at this site. The water temperature was cold enough that we were quite unhappy with our drysuits because they weren’t keeping us particularly warm. We could see ice crystals flowing by in the water. The bottom conditions instantly turned into blackout at the slightest fin touch. The current was strong and unrelenting. One student dropped his face mask and it instantly vanished in five feet of water. No amount of scouring the bottom revealed where the mask had gone. But the students learned a lot and are much better divers for the experience. Sweethome, Oregon is just down the road. Head east from Sweethome on US 20 (Santiam Highway) and look for signs to Calkins Park and Quartzville Road. Right after you turn left onto Quartzville Road, take another left into Calkins Park. We went diving here in the late winter and had the place to ourselves. In the summer and fall, parking is packed. Imagery ©2017 Google, Map data ©2017 Google. Calkins Park is a good place for training dives in challenging conditions but otherwise is not something that we dive regularly. The shore runs more or less east west. Deeper water is to the north. Steer clear of the boat ramp when people are actively loading and unloading boats. We suggest taking a dive flag along if there are boaters in the area. We have a dive flag that we love and use listed on our Gear We Use page. If there isn’t any boat traffic, you can use the boat ramp. Otherwise, the beach to the west of the boat ramp is usually a good entrance even when the water is very low. This is a shore dive although you could practice boat diving here. Conditions vary widely based on the time of year and water level in the reservoir. In the summer and fall, there is very little current and the site gets a bit stagnant from the water not moving. In the winter, icebergs can flow into the lake with the water level so low that the site is not diveable. The best we have ever seen here is about five feet of viz. If you even so much as look at the bottom the wrong way, you will have instant blackout conditions that will not clear if there isn’t enough current. 32F during snowmelt all the way up to 65F at the end of a hot, dry summer. There isn’t any boat traffic here in the winter which is desirable. Otherwise this site can be dived any time that the water is high enough and you are bold enough to do so. The max depth really varies based on how much water is in the reservoir. When we went diving here in the winter, we never went below 30 feet but in the summer when the reservoir is full, you could see 60-70 foot depths. Open water divers can dive this site. It would be a good place to practice your neutral buoyancy skills and navigation. This is an easy dive with an easy entrance. The only difficulty is when the water is freezing cold and when you get blackout conditions because you stir up the silt. Depending on parking and water level, 50-500 feet. No surface swim is needed usually. Ask yourself if you really want to dive here before you bother setting up your gear. We think this is a pretty miserable dive site in the winter and spring. In the summer and fall there is a lot of boat traffic. The bottom stirs up and reduces visibility to absolutely nil. When the water level is low, the lake bed becomes a series of morasses and mud flats where people sometimes get stuck up to their waists in the mud. Go gingerly through the mud and turn back if you start to hit quicksand. There isn’t any dive shop around Calkins Park. The closest shops are in Salem and Eugene. Sweethome has a couple decent restaurants. Let us know if you have a favorite that we should try! There is plenty of camping in the area at federal campgrounds, private campgrounds, and off forest roads where you can do primitive camping. We haven’t tried any hotels or cabins in the area. Let us know if you know of a good hotel that is SCUBA diver friendly in the area!